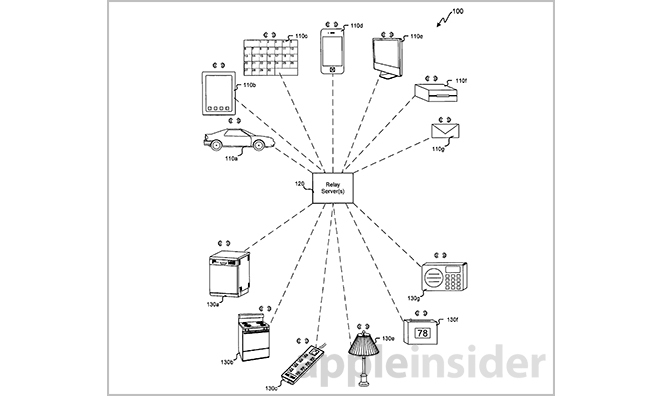 In an interesting and somewhat exhaustive patent awarded to Apple on Tuesday, the company outlines technology that can adaptively track a user's location and use the data to intelligently control secondary devices at another locale, such as home appliances. Many believe home automation is the next tech frontier; a marriage of hardware and software that can make an incredible impact on our daily lives. Already, companies like Nest and Philips are automating tasks with their respective Nest Learning Thermostat and Hue light bulb products. While some firms offer all-encompassing home management solutions that can control everything from turning on lights, to remotely closing a garage door, these systems usually require some type of user interaction. Apple is looking to take user input out of the equation, to be replaced by an intelligent system that uses a person's location and habits to automatically control at-home appliances. 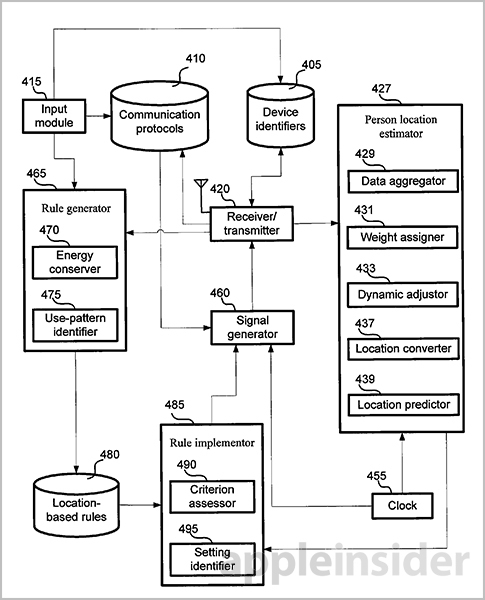 As published by the U.S. Patent and Trademark Office, Apple's U.S. Patent No. 8,577,392 for a "System and method of determining location of wireless communication devices/persons for controlling/adjusting operation of devices based on the location" describes a system that uses data gathered by static and mobile devices, along with wireless communications tech, to determine a user's current and guessed future location. Based on these observations, certain preset functions in the home can be activated or deactivated remotely and automatically. Apple's invention is rooted in location data. A user's position can be obtained from any number of outlets, including a computer login, an iPhone transmitting GPS coordinates and cell tower triangulation, among others. These so-called "first devices" are integral to the automation process as they act as triggers for the control of "second devices," like televisions, lights and more. In some embodiments, the first devices are tasked with feeding location data to relay servers when a predetermined condition is met. For example, an iPhone can provide GPS information every five minutes, or when it connects to a new cell tower. In other cases, the system can randomly query devices to save battery life. Alternatively, devices in a fixed position can be used to relay information on a user's activities. Examples include ID badge swipes, credit card use and logging into a social networking site from a desktop computer. Further, a user's location can be categorized much like Apple's current geo-fencing technology. For example, a user can define a "work" and a "home" zone, with the system able to activate tracking when they leave or arrive within a predetermined fence. By aggregating and processing this constant flow of location data, relay servers can estimate a user's current and future position to within a certain degree of accuracy. This is important for the operation of certain at-home devices, like a garage door or an alarm system. Precise location data can also be used to trigger events. For example, if a user is on their home street, the system can turn on exterior house lights as they approach. After processing, the relay servers push a signal out to second devices, instructing them to commence an operation or change operational states. Second devices can be any number of products. Examples given include washing machines, ovens, lights, power strips, lights, climate control systems and more. Second devices can also be monitored to determine whether they are already on or off, as well as other modes of operation, before the system sends a control signal. While first devices can communicate wirelessly, second devices may be attached to the relay system via USB or some other physical means. It should be noted that some type of communications protocol is required, whether it be Wi-Fi, Ethernet or cellular, to connect with relay servers. More than one user can be associated with a given home automation system, which means relay servers would have to parse data and check rulesets for both. 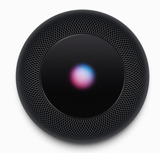 Finally, Apple's invention works not only in long-distance applications, such as work-to-home, but from within the house itself. In this way, lights can be turned off when a user leaves for a certain amount of time, or heaters can be turned on or off depending on activity levels. Although Apple's current hardware lineup can handle the invention's requirements, a number of hurdles stand in the way of its deployment, not the least of which being infrastructure costs to the consumer. 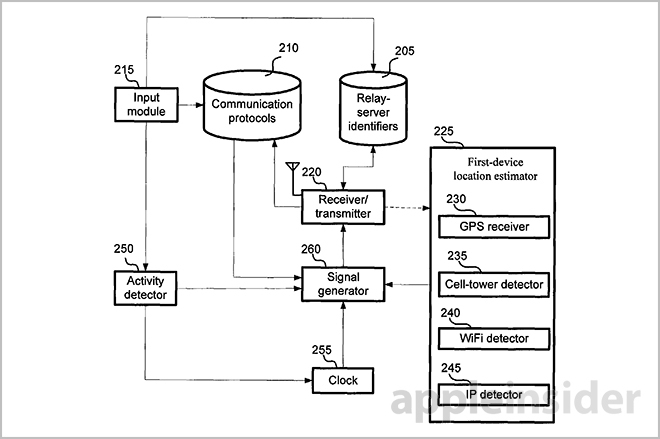 Apple's location-based home automation patent was first filed for in 2012 and credits Raghunandan K. Pai and Timothy S. Hurley as its inventors.